On the West Coast, a casual maxi dress is an undisputed wardrobe essential—or so I've gathered from the many L.A. bloggers I follow on Instagram, all of whom seem to have enviable houseplant collections and matcha-making skills. Like a jumpsuit, a long dress is a one-and-done outfit but with the added bonus of flowy silhouettes and billowy skirts. (A maxi dress also doesn't require you to get fully naked every time you use the restroom, an obvious plus). Because of the long skirt on a maxi dress, it's a more full-coverage piece by nature, but you can mix it up by selecting versions with low necklines, body-skimming silhouettes, or side slits. And since the vibe you're probably going for is low-key, flats are clearly the winning option. Below, shop 14 relaxed maxi dresses to wear now. So comfy but chic enough to wear to a nice dinner. Wear this dress with the crossover straps cinched at the front (as shown above) or reverse it for a classic square neckline. Equally chic with sneakers and with heels. The fall-friendly version of summer's gingham trend. All denim, all the time. You can't go wrong with a good T-shirt dress. 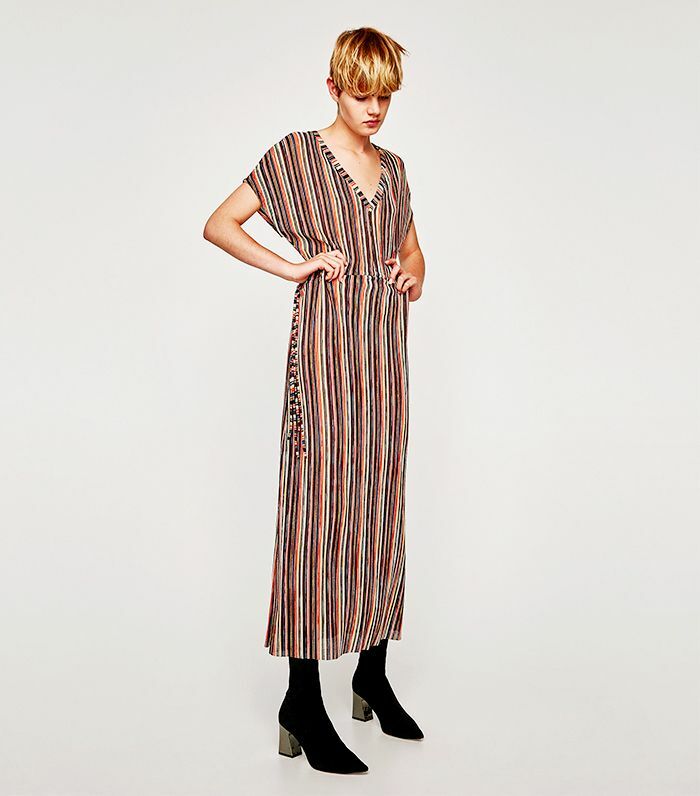 Leave it to Ganni to make us feel like we need yet another slip dress. An ideal cold-weather date dress if we ever saw one. Hugs your curves in all the right places. Perfect for a day of brunch and vintage shopping. The lace-up back is subtly flirty. One of our favorite takes on the pajama-dressing trend. The brand behind your favorite hoodie and leggings is taking on the T-shirt dress—and nailed it. Style this with a leather jacket for a contrast of tough and delicate. Up next, read about the affordable sweater It girls are scooping up for fall.